Or sign up for the closed beta now. 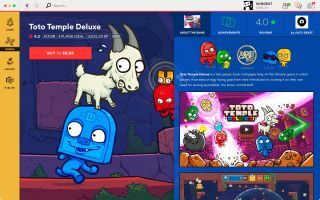 Online gaming portal, Kongregate, publisher of various PC and web games, will be making its new downloadable platform Kartridge open to the public on November 1. The downloadable platform was first announced earlier this year. As well as operating as a storefront, Kartridge will have a global chat system in place and will reward you for playtime, giving you certain perks as you level up your account. Players can earn experience by completing certain achievements and collecting badges. As your account earns levels you'll unlock rewards that could include a discount or a free game. Kartridge will launch with over 200 games from developers such as Double Fine, Versus Evil, and Thunder Lotus. The platform will apparently include an easy-to-use content upload process for developers, as well as core community features and tools. If you can't wait until November 1 to try it out, you can sign up for the closed beta here.